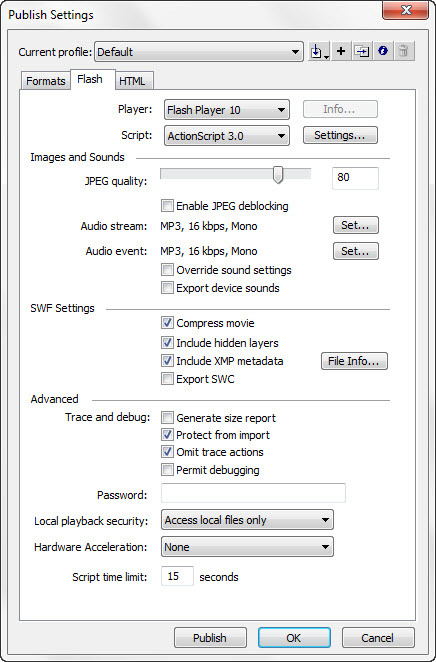 Select File > Publish Settings to display the Publish Settings dialog box shown below. You will work with the Formats tab, the Flash tab, and the HTML tab of this dialog box. On the Formats tab, verify that the Flash and HTML checkboxes are checked. 1. 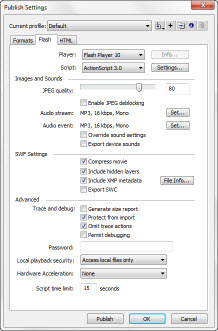 Check Protect from import. 2. Check Omit trace actions. On the HTML tag, verify that Loop is unchecked — we only want the animation to play once. Checking Loop will cause the animation to repeat over and over. 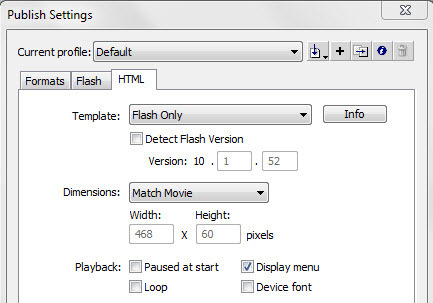 View the source code of the web page to see the HTML code automatically generated by Adobe Flash to display the Flash movie. You can copy and paste this code in your own web pages as needed. You've created your first animated banner using Flash! You have completed the Flash Animated Banner Tutorial. As you may have noticed, we have barely scratched the surface of what Flash is capable of. Consider further study by taking courses. 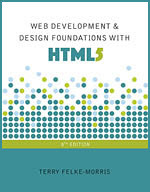 There are also many other online Flash tutorials available on the Web.